Raaga.com: Will Zoya Akhtar hit a hat-trick with DIL DHADAKNE DO? 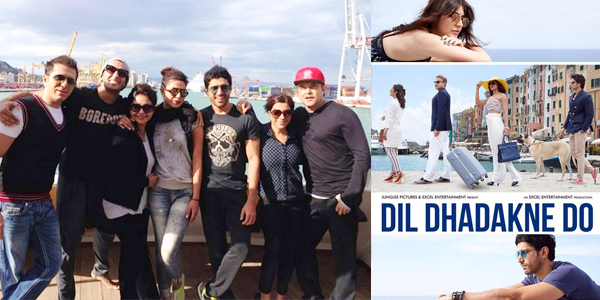 Will Zoya Akhtar hit a hat-trick with DIL DHADAKNE DO? After rocking Indian Cinema with two critically as well as commercially acclaimed films LUCK BY CHANCE (2009) and ZINDAGI NA MILEGI DOBARA (2011), the young and immensely talented writer -director Zoya Akhtar, is set to face the verdict of the masses today (June 5) when her much anticipate film DIL DHADAKNE DO hits cinema halls. Though the film fraternity has given a thumps up to the films with Amitabh Bachchan to Aamir Khan to Anurag Kashyap praising Zoya Akhtar to great heights but the acid test for Zoya will be at the box office. The success of the movie is much important for Zoya Akhtar because after giving two brilliant films LUCK BY CHANCE (2009) and ZINDAGI NA MILEGI DOBARA (2011), incidentally both films won Zoya Akhtar Best Director hence the expectation of the film buffs have risen. One hopes she lives up to the expectations of the people. The business of films is such that no matter how intellectual cinema a filmmaker makers but if it fails to entertain the films buffs, who throng cinema halls, all the efforts of the filmmaker go in drain. Remember Raj Kapoor’s MERA NAAM JOKER, Ramesh Sippy’s SHAAN and the latest example being of film wizard Anurag Kashyap’s BOMBAY VELVET. Prior to the release of the films the film fraternity was all in praise of Anurag Kashyap’s BOMBAY VELVET. Even the film critics were going gaga over Anurag Kashyap’s marvelous attempt but on day one the film audience booted the film out of cinema halls. However Zoya Akhtar has reasons to celebrate as one thing is in her favor and that is the trend of family dramas doing roaring business at box office. Bollywood trade pundits are hopeful that Zoya Akhtar will hit a hat-trick with DIL DHADAKNE DO considering the movie’s family plot.